Dear friends, I am one of those people that so many booklovers loathe: I write in my books. I wrote about this in more detail last week, so if you want to join the do-you-write-in-books-debate, click on over and check it out. I love click-throughs. But here, I just wanted to mention that even when I am not taking notes in my books, underlining and marking passages to revisit later on, I mark the typos. And there are inevitably typos, people. You know that. 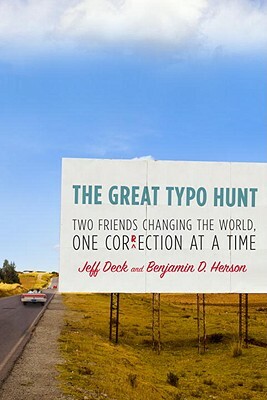 Which is why I was thrilled to receive a copy of The Great Typo Hunt for Christmas this year. Two friends changing the world one correction at a time? Sign. Me. Up. I want to go back in time and roadtrip with them, actually. Can we make that happen? Seems the best we can do is a recap of that very trip, which is exactly what The Great Typo Hunt is. Only with more pontificating. This pseudo-memoir, pseudo-case-against-mistakes-in-the-English-language covers the epic three-month roadtrip in which Jeff Deck drove all the way around the country - not just across it, but around it - with various friends in tow, correcting the inevitable typos of the world. Though I myself am obsessed with typos and grammar mistakes (and I love to correct them, and - god forbid! - be corrected should I make one), this book fell a little flat for me. Though I understand that the obnoxious, overstated manner in which it is written was intentional hyperbole, it was grating at first, and only bearable by the end. I get it. Really, I do. It's supposed to be funny overstatement, grandiose claims on the importance of this journey and this book to account for the importance of speaking and writing correctly. But really, get over it and just tell me about the typos. Luckily, in that regard, the book did not disappoint. Typos abound - mostly in stories and pictures of those they spotted and corrected across the nation, but also one on page 99 where a space is missing between the end of one sentence and the beginning of the next. See? I told you I spot them. And circle them, too. Deck's and Herborn's account of correcting typos is often humorous, sometimes laugh-out-loud so, and occasionally disheartening, as we come across people who just can't seem to care. Grammar is important, people! Spelling, too! And punctuation changes the meaning of a sentence. Really, it does. Not everyone sees it like that, of course, which accounts for the artist who didn't mind selling "art" that read "Bon Appetite" or the court case filed against Deck and Herborn for changing a National Park sign without permission. Yes, an actual court case. In a real court. This is what the National Park Service is doing with their limited budgets. Deck and Herborn often descend into the trap that is pontification (I just can't resist using that word), which, though dragging at times, is somewhat inspiring, too. Bottom line: Us bookworms love our language, and, like Deck and Herson, strive to see it used correctly. That means you. That means spelling, grammar, and punctuation. That means correcting errors and learning why they were wrong in the first place. Though at times subjective, there are rules to language for a reason - to allow us to communicate clearly. In the end, Deck and Herson realize that this is their ultimate goal - to improve communication. And this end goal, though worthwhile and important, is bogged down in overwritten passages and standoffish text. The concept is a good one, but the book fails to stand up to its potential. That, and it has a typo in it. As an afterthought, I would also mention that the book has a not-so-useful appendix in the back, detailing various grammar rules, how to spot them, and how to use that particular device correctly (apostrophes, commas, etc). I question whether or not Deck and Herson - and their publisher, for that matter - really understood their readers on this point. After all, wouldn't someone drawn to reading a book about typos not being interested in a bare-bones how-to guide? One can safely assume we already know where to place apostrophes, and a part of us gets off on telling other people where they go. We don't need step-by-step instructions here. FYI, if you're finding a ton of errors (in finished books, NOT in ARCs which haven't had a final proofread yet) and feeling very helpful or have a lot of time to kill, it would be great if you passed those along to the publishers. They can then correct them in the next printing of the book. Maybe you were meant to be a proofreader/copyeditor! I flipped through this book at work and decided I didn't think I could read it. After eight years as a copyeditor, I've learned that being nitpicky is of course necessary but there is such a thing as letting ego get in the way. I've read too many posts by people who get all snarky about the whole thing, and now I'm wary (not talking about you, by the way!). There are things, even if we're so sure they should be corrected, that sometimes need to be let go. Incorrect things, like misused quotation marks or commas or misplaced apostrophes are of course non-negotiable, but the trick to being a good copyeditor is knowing the rules and when to break them and also not letting your own preferences get in the way. Since these are supposed to be typos, likely they all need correction. Yet typos, in my mind, are also forgivable; they aren't really grammatical errors that should have been caught by the copyeditor. They're missed spaces, mixed-up letters, missing or extra periods, things that should be caught by the proofreader but are sometimes missed because there isn't one perfect proofer out there. I see typos less as ignorant errors and more as oversights. It's very easy to miss stuff, as much as we pride ourselves on catching things others have missed. In the end, I actually become a bit turned off by those grammar nazis who are eager to point out every little error. You set yourself up for criticism, too; inevitably, while going on about your indignation, you'll make an error! It's happened to all of us. I loved Eats, Shoots & Leaves, though! PS. I completely agree with your sentiments on the importance of our language and caring about using it well. I admire that in you! Great review. Being a typo-nerd myself, I was really looking forward to this book. I read the first 15 pages or so on my Nook, and it just didn't do it for me, unfortunately. I'm relieved to hear that it didn't get magically better later on!